A leading freedom fight dies in a war between faiths, west and east. Thousands of refugees flee to a neighboring country. Sound familiar? This is Albania, 15th century. The Ottoman empire has amassed the largest army the world has known and is inching westward into Europe. The town of Krujë is under siege and has repelled two assaults under the command of George Kastrioti, known as Skanderbeg. During a third siege Skanderbeg succumbs to malaria. Krujë falls shortly thereafter and the Ottoman empire expands. Albania’s long resistance has given Vienna time to prepare, but the Turks are on the march. In the next century nearly 300,000 Albanians fled their homeland, most to southern Italy. Modern Italy retains a link to Albania through the descendants of these refugees who established villages throughout the south. Barile, the birthplace of my great-grandparents, is one of these villages. These Italians of Albanian descent are known as the Arbëreshë. They speak a language that’s basically unintelligible to modern Albanians (and of course Italians). It is the language of pre-Ottoman Albania, roughly equivalent to someone today speaking 15th century English in conversation. Despite not officially being classified as a protected ethnic minority in Italy, the Arbëreshë have retained customs and rites through to today, including a very peculiar singing style. 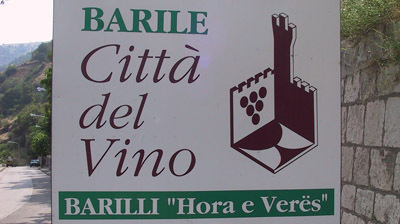 When I visited Barile in 1993 all the town signage was in Italian exclusively. In 2003 it was bilingual with Arbërisht underneath. I take this more as a tourist play than any kind of ethnic resurgence. Still, a good thing. As I’ve said before, the diversity of the south of Italy can be quite surprising, permitting glimpses into non-Roman cultures that you don’t find in the hills of Tuscany and alleys of Rome. Of course, the struggles in Albania and the former Yugoslavia continue today. As does the exodus of refugees to Italy, particularly after the fall of communism. The most recent flight is excellently portrayed in the film Lamerica. My email address: sishkon@gmail.com loosely means ‘how goes it’, what’s happening or how is it going. Modelled after the phrase ‘se si ashkon ajo’, ..
My parents were born in Barile. Immigrated to Canada in the 1950s. My parents taught me the language you describe as that of “pre-Ottoman Albania” as well as Italian. Their move out of Italy actually to an even greater extent froze them in time linguistically. I hope there are forces acting to maintain this cultural heritage in Barile and other parts of Southern Italy and not just as a tourist attraction. It would be a shame if it was lost.